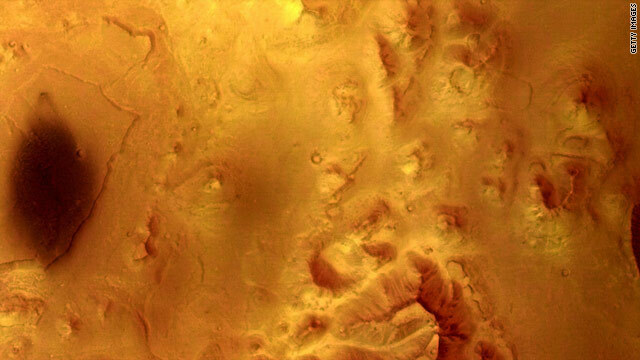 Photo by Mars Express in 2004 shows features of the planet indicating erosion that appeared to be caused by flowing water. Editor's note: Robert Zubrin is president of the Mars Society and the aerospace R&D firm Pioneer Astronautics, which does research and development for NASA and other agencies. An updated edition of his book, "The Case for Mars: The Plan to Settle the Red Planet and Why We Must" has just been published by Free Press. (CNN) -- America's human spaceflight program is now adrift. On July 8, the space shuttle is scheduled to make its final flight, and the Obama administration has no coherent plan for what to do next. Instead, as matters stand, the United States will waste the next decade spending $100 billion to support an aimless constituency-driven human spaceflight effort that goes nowhere and accomplishes nothing. For NASA's human exploration effort to make any progress, it needs a concrete goal, and one that's really worth pursuing. That goal should be sending humans to Mars. As a result of a string of successful probes sent to the Red Planet over the past 15 years, we now know for certain that Mars was once a warm and wet planet, possessing not only ponds and streams, but oceans of water on its surface. It continued to have an active hydrosphere on the order of a billion years -- a span five times as long as the time it took for life to appear on Earth after there was liquid water here. Thus, if the theory is correct that life is a natural phenomenon emerging from chemistry wherever there is liquid water, various minerals and a sufficient period of time, then life must have appeared on Mars. Furthermore, we know that much of that water remains on that planet today as ice or frozen mud, with the soil of continent-sized regions of the planet assessed as being more than 60% water by weight. Not only that, scientists have discovered that Mars has liquid water, not on the surface, but underground, where geothermal heating has warmed it to create environments capable of providing a home for life on Mars today. We have found places where water flowed out of the underground water table and down the slopes of craters within the past 10 years. Indeed, we have detected methane emissions characteristic of subterranean microbial life emerging from vents in the Martian surface. These are either the signatures of Martian life or the proof of subsurface hydrothermal environments fully suitable for life. If we go to Mars and find fossils of past life on its surface, we will have good reason to believe that we are not alone in the universe. If we send human explorers, who can erect drilling rigs that can reach underground water where Martian life may yet persist, we will be able to examine it. By doing so, we can determine whether life on Earth is the pattern for all life everywhere, or alternatively, whether we are simply one esoteric example of a far vaster and more interesting tapestry. These things are truly worth finding out. Mars is a bracing positive challenge that our society needs. Furthermore, Mars is a bracing positive challenge that our society needs. Nations, like people, thrive on challenge and decay without it. The challenge of a humans-to-Mars program would be an invitation to adventure to every young person in the country, sending out the powerful clarion call: "Learn your science and you can become part of pioneering a new world." There will be more than 100 million kids in our nation's schools over the next 10 years. If a Mars program were to inspire just an extra 1% of them to pursue a scientific education, the net result would be one million more scientists, engineers, inventors and medical researchers, making technological innovations that create new industries, find new cures, strengthen national defense and generally increase national income to an extent that utterly dwarfs the expenditures of the Mars program. But the most important reason to go to Mars is the doorway it opens to the future. Uniquely among the extraterrestrial bodies of the inner solar system, Mars is endowed with all the resources needed to support not only life but the development of a technological civilization. For our generation and those that will follow, Mars is the New World. We should not shun its challenge. And we are ready. As I show in detail in my just updated book, "The Case for Mars," we are much better prepared today to send humans to Mars, despite its greater distance, than we were to send men to the moon in 1961, when President John F. Kennedy started the Apollo program. We got to the moon eight years later. For our generation and those that will follow, Mars is the New World. We should not shun its challenge. Future-fantasy spaceships are not needed to send humans to Mars. The primary real requirement is a heavy-lift booster with a capability similar to the Saturn V launch vehicle employed in the 1960s. This is something we fully understand how to engineer. The mission could then be accomplished with two launches. The first would send an unfueled and unmanned Earth Return Vehicle (ERV) to Mars. After landing, this vehicle would manufacture its own methane/oxygen return propellant by combining a small amount of hydrogen imported from Earth with a large supply of carbon dioxide acquired from the Martian atmosphere. The chemistry required to perform this operation has been widely practiced on Earth since the gaslight era. Once the propellant is manufactured, the crew is sent to Mars in a habitation module launched by the second booster. After a six-month voyage to Mars, the hab module is landed near the ERV and used as the crew's base for exploring the Martian surface. Using spacesuits for protection in the thin Martian atmosphere, the astronauts would then spend the next year and a half exploring for past or present life, and then enter the return vehicle for a six-month voyage home. The hab module is left behind on Mars, so each time a mission is flown, another habitation is added to the base. There is nothing required by such a plan that is beyond our technology. The issue is not money. The issue is leadership. NASA's average Apollo-era (1961-73) budget, adjusted for inflation, was about $19 billion a year in today's dollars, only 5% more than the agency's current budget. Yet, the NASA of the '60s accomplished 100 times more because it had a mission with a deadline and was forced to develop an efficient plan to achieve that mission and then had to build a coherent set of hardware elements to achieve that plan. If President Barack Obama were willing to provide that kind of direction, we could have humans on Mars within a decade. The American people want and deserve a space program that really is going somewhere. It's time they got one. Fortune favors the bold. Mr. President, seize the day. The opinions expressed in this commentary are solely those of Robert Zubrin.